Last week, I was prowling about the farmer's market and I happened upon a table that was selling stalks of locally grown popcorn. 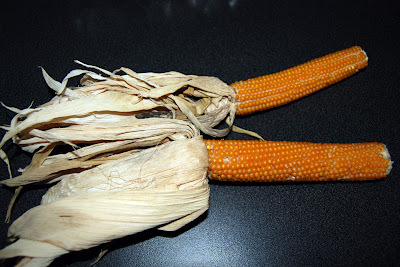 I remembered reading a post over at the Chiot's Run about growing popcorn I'd been intrigued. I'd never put much thought into how the dried little kernels made it from a stalk into the package. So, I snatched-up a few stalks. As I paid the woman, I asked if there was anything special I needed to know about popping them. "Oh, you just scrape them off," she said as she mimed a scraping motion, "and pop them in a pot with some oil like usual." 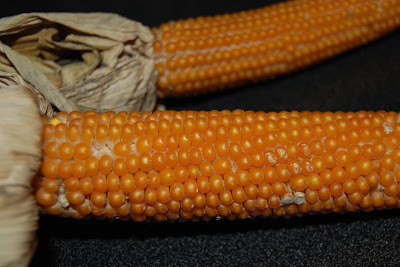 As it turns out, popcorn starts its life much like sweet corn. The farmer then pulls the husks back at the end of the season and allows them to air-dry on the stalk, hoping birds don't start treating the field like their own personal buffet. 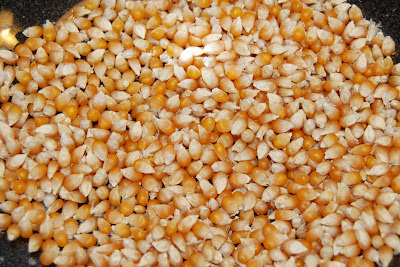 I now have a small container of tiny kernels sitting in the pantry, waiting for a a good movie to arrive from Netflix. 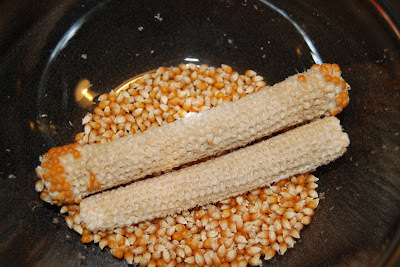 I'll be sure to post some photos of the popped corn when we get around to making it and let you know how it tasted.